April 08–With the help of a lot of caffeine, the entrepreneurship program that’s taking the nation by storm launched in Norman this week. In addition to the first 20 guests receiving a free One Million Cups stainless steel travel coffee mug, the 75 or so folks assembled received free samples from Yellow Dog Coffee Company. The event is a community endeavor led by the Norman Economic Development Coalition and supported by several other community groups, including the Norman Arts Council who provided MAINSITE art gallery on downtown Main Street as the venue. This month’s presenters were Sereta Wilson of Yellow Dog Coffee (yellowdogcoffeecompany.com) and Carey Flack of Bloom (discoverbloom.com), a language learning company focused on indigenous language acquisition. 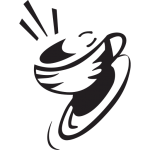 The 1 Million Cups program takes place on Wednesday mornings from 9-10 a.m. in locations around the nation. Each city runs the program semi-autonomously with entrepreneurs and communities gathering in local coffee shops, co-working spaces and other community establishments. Sereta presented for Yellow Dog Coffee, but husband Rob is the artisan who roasts the beans. During their travels, the Wilsons fell in love with some coffee shops across the nation, particularly one discovery in Colorado. When they decided to add roasting and selling coffee to their current list of business ventures, they knew they wanted to keep the business in Oklahoma. A portion of all coffee proceeds goes to benefit the dog rescue, and the Wilson’s are as passionate about finding fair trade coffee as they are about dogs and coffee roasting. During Rob’s spirit quest, he found Diedrich Roasters in Sandpoint, Idaho and attended a workshop to learn how to roast. Since then, he’s perfected the technique. The craft coffee is small batch roasted and sold fresh. The couple hopes to host some workshops at their farm help other coffee roasters, as well as to continue to be a local source for restaurants and other venues including their local subscription service. The cost is higher than buying beans at the grocery, but the Wilson’s work hard to make sure their coffee is worth the cost. Language is inextricably tied to culture, said Flack during her presentation on the unique startup she and a team of entrepreneurs and specialists are developing to break away from Westernized learning methods employed by most language learning companies. Bloom aligns its curriculum with successful Indigenous language revitalization methods such as immersion that have been adapted into a virtual world. “Our target markets include both heritage and non-heritage learners,” Flack said. Linguistic communities and their cultures are being lost. Saving those languages and culture improve youth confidence and help prevent the above average rates of suicide and other negative behaviors often associated with cultural loss, she said. “Bloom is an indigenous language learning tool,” Flack said. Bloom offers free intermediate-level learning courses for global Indigenous and minoritized (marginalised) languages that are developed in collaboration with Native Nations, international governments, satellite groups, and educational institutions. The cost is about $11,000 per course to an institution. Flack said language is important because it holds identity, family stories, and ways of life. When an Indigenous language is lost, there are social, political and personal ramifications. The program starts with normal, everyday conversations and then breaks them down, creating the immersion component. “Because there’s a cultural component, a lot of communities want to be part of what we’re doing,” Flack said. The team wants to offer at least 50 languages, but the ultimate goal is 100 languages. The program will work on phones, iPads and laptops. “Down the line, we will have an app,” Flack said. Bloom’s No. 1 need right now is more capital. A video of Flack’s TED Talk, “The Power of Our Words from Language Stigma to Language Celebration,” is available on YouTube. The One Million Cups program was founded nearly a decade ago by the Kauffman Foundation, a leading think tank on entrepreneurship, said Norman Economic Development Coalition Vice President Maureen Hammond. Each month, the 1MC program offers two local entrepreneurs an opportunity to present their startups to a diverse audience of mentors, advisors and entrepreneurs. To apply to be a presenter, see 1millioncups.com/norman.